Our cannabis crystals are perfect if you’re looking for maximum purity CBD. 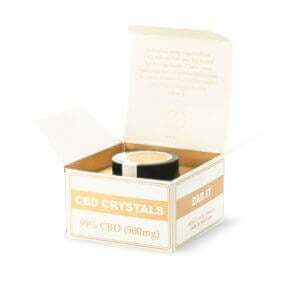 Our range includes our 99% Pure CBD Crystals, containing absolutely no THC (the part of the plant that gets you ‘high’). CBD crystals (sometimes referred to as CBD isolate) are extracted from the cannabis sativa plant. As with all our CBD products, the CBD within our crystals comes from our EU-certified organic hemp. To achieve a high purity of CBD, we use the state-of-the-art supercritical CO2 method. We then use a second purification process to separate the CBD from the other remaining natural chemicals until we reach the desired purity – 99% to be exact. The remaining 1% is made up of the terpenes Myrcene, Limonene, Alpha & Beta-pinene, Linalool, B-caryophyllene, Caryophyllene oxide, Terpinolene and Humulene. These are the organic compounds found naturally in cannabis plants. This is all important because of what’s called the ‘entourage effect’, which is the special synergy between the botanical substances that can increase the effect of CBD. However, you can still use our crystals if you are sensitive to terpenes. What are the benefits of using CBD crystals? With cannabis crystals, you can make your own CBD products like CBD vape oil or edibles. You can even make your own CBD tinctures by dissolving the crystals into a carrier oil, like coconut oil. Please be aware that pregnant women and lactating mothers should not use CBD crystals.